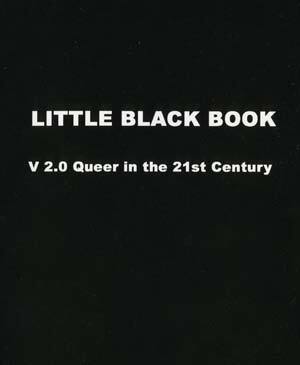 "The Little Black Book - Queer in the 21st Century"
"The Little Black Book - Queer in the 21st Century." 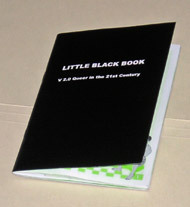 Handed out at Brookline High School during GLSEN event April 30, 2005. Is this the future? This booklet was distributed to hundreds of kids (middle school age and up) at Brookline High School, Brookline, MA, on April 30, 2005. 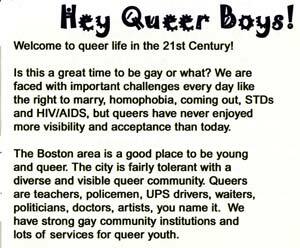 It was written by the Boston-based AIDS Action Committee, with help with the Massachusetts Department of Public Health and the Boston Public Health Commission. The event that day was designed for children and their teachers across Massachusetts, organized by the "Gay Lesbian and Straight Education Network" (GLSEN). This is the group that runs "Gay-Straight Alliance" clubs in public schools across the country. You must ask yourself: What kind of person would write this? What kind of person would give it to kids? Where is this movement headed? Click here for full report of event, including photos, news reports, Governor's statement, and more. Here's the reaction from a medical expert on sexual transmitted diseases: click here. Is this the homosexual movement's opinion of kids and young adults? 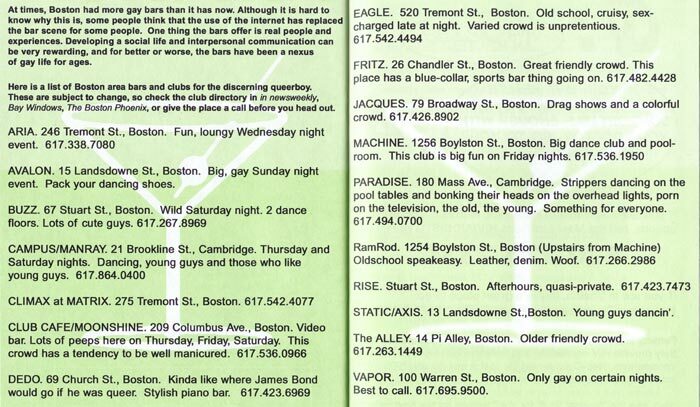 As the text says, "Here is a list of Boston area bars and clubs for the discerning queerboy." 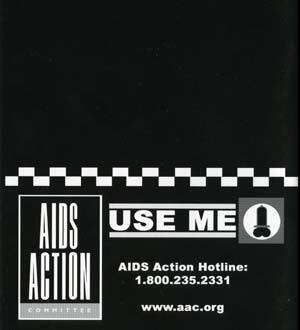 Back cover of booklet, with Aids Action Committee logo and contact information.